Mountaingrass tickets are now on sale! Make sure you’ve renewed your ABOTMA membership to get your discount code for $35 off your full weekend Mountaingrass ticket. Also, as an ABOTMA member you are eligible to buy Premium tickets, offered for the first time this year. Your premium ticket gets you an exclusive invitation to a meet-and-greet reception with our guest artists, reserved seating in the front two rows of the main marquee, and your very own Mountaingrass seat cushion. There are only 30 premium passes, and they are only available to ABOTMA Members. 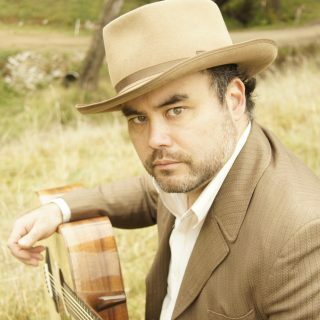 We are very pleased that Harrietville favourite and multi-Golden Guitar winner Pete Denahy will be returning to Mountaingrass this year with his perfect blend of comedy, songwriting, and expert bluegrass musicianship. Making her first appearance at Mountaingrass, Freya Josephine Hollick will be bringing her old-time sensibility and original songs very reminiscent of the Carter Family classics. Also returning to Mountaingrass this year are festival regulars Appalachian Heaven (VIC) and The Pipi Pickers (NZ). These two bands, representing the old-time and bluegrass genres respectively, are always crowd pleasers and just plain fun to have around. Keep tuned to our Facebook page and mountaingrass.com.au for more artist announcements soon! The Mountaingrass and ABOTMA Member Survey will be closing up at the end of this month. Your opinion matters a great deal to us, and the results of this survey will determine our direction for 2017. Alan has been making banjos for over 30 years. Nearly all parts of his White Swallow banjos are made in his Adelaide workshop. He currently produces over 10 styles of banjo including 5 string bluegrass style, open back, plectrum and tenor banjos in conventional or deep resonator styles, and top tension. 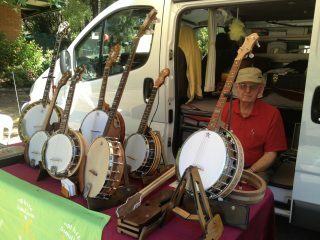 Alan will custom make your banjo to your specifications and requirements. When you’re ready to start planning your weekend, make sure you join the Mountaingrass Accommodation and Ride Share Group on Facebook. Make new friends and save some money by sharing transport and accommodation with your fellow Bluegrass and Old Time Music lovers! If you wish to camp, the only camping available in Harrietville is the Harrietville Caravan Park & Cabins. The nearest free camping areas are in Smoko and Freeburgh. You can get more information about free camping options in the Alpine Shire from the Free Camping Guide for North East Victoria.